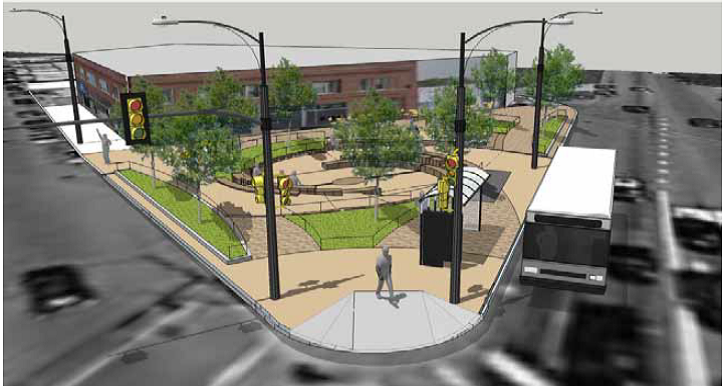 Preliminary design for Woodard Plaza, at the intersection of Milwaukee, Kimball and Woodard avenues. The current intersection of Milwaukee, Kimball and Woodard avenues, looking south on Kimball. Torrential rain drenched the city in 2010. Lula Cafe in Logan Square, like many homes and businesses, was inundated and had to shut down for a few days due to flooding. Barely a year later the same thing happened, and is expected to continue recurring as climate change contributes to heavier storms in the Chicago area. “There’s a very high concentration of 311 calls for flooding in this neighborhood,” said Kara Riggio, a senior research associate with the Metropolitan Planning Council. MPC manages a $200,000 grant from the state Environmental Protection Agency to seed green infrastructure projects on 79 acres of North Milwaukee Avenue between Kimball and California avenues. Right now about 95 percent of that area is made up of impervious surfaces that prevent rain from soaking into the ground, further aggravating an overburdened stormwater system. Their goal is expand the pervious surface area, sprinkling natural filtration systems throughout several urban neighborhoods. So far they have approved six projects in what they’re calling The Milwaukee Avenue Green Development Corridor. Recently they approved plans to turn a drab concrete island bounded by Milwaukee, Kimball and Woodard avenues into a parklet that will prevent 4,434 gallons of stormwater from entering the sewer system during each one-inch storm event. The design expands pervious surfaces by a factor of eight, from 185 square feet to 1,500. Dubbed Woodard Plaza, its features include a concrete runnel that directs water collected throughout the plaza toward five infiltration planters, which include native plants. The plaza will receive some additional runoff from adjacent streets by lowering the curb in some places. It could be a boon for the pedestrian experience around that intersection, which is home to the Logan Square Community Arts Center and Hairpin artist lofts, but remains a spit of concrete amid busy streets. The design team includes Terry Guen Design Associates, with civil engineering from McDonough Associates and soil testing from Wang Engineering. Grant funding only accounts for 8 percent of the total cost, but the rest has been secured through the Chicago Department of Transportation’s Make Way for People initiative and tax increment financing (TIF) funding. On Saturday MPC will hold a workshop in Logan Square’s Comfort Station (2579 N. Milwaukee Ave.) with information about the grant program, which still has $80,000 to award.